Professional Bridge Masonry Saw using 350mm blade with 850mm cutting length available. Lightweight aluminium frame, with ball bearing technology assisted precision cutting. The Bridge Masonry Saw Venus is designed to cut and mitre any kind of construction material, specially those with oversized dimensions, in a fast, clean and precise way. It is suitable not only at building site but also at masonry workshops to cut marble, granite, etc. Exclusive SIMA designed cast-aluminium sliding cart with 8 adjustable sealed bearings guarantees the most precise cutting on the market. 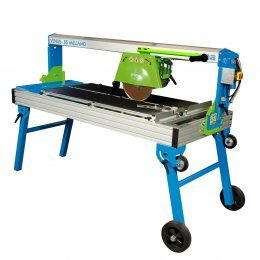 Innovative cutting head system which allows two blade sizes 300 & 350 mm with an easy adjustment. Side support with two clamps (Optional). Side support with two clamps (Optional). to 5 cm high pieces (Optional). Self-cleaning felts for the sliding.